Winner 2009 | What Car? We have now revealed the winners of all the categories that make up the What Car? 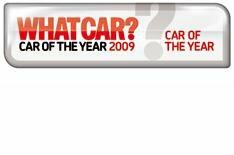 Car of the Year Awards for 2009, but which car has triumphed to win the ultimate accolade? See the moment that Ford's triumphant Fiesta was revealed by What Car? Editor Steve Fowler. Once we'd picked our chins off the floor, we were well aware that this is the perfect car for now; it's the epitome of the stylish, modern supermini. For a start, just look at it. In a world where its rivals blend in, the Fiesta positively shouts ta-dah' with its blend of delicate curves and sharp edges. There's no other supermini that even gets close to its look at me' factor. While others stare at the outside, you can climb in and focus on the eye-shaped instruments ahead. Wrench your stare away from that and you'll see the centre console has been aimed at those people who can text 60 words a minute; it's styled like the latest mobile phone keypad, so it's dead easy for anyone to engage with it quickly. Dial in the perfect driving position and you're ready to go and all of this has merely heightened the anticipation of actually turning the key. Things get even better immediately, because the Fiesta simply blows away any other supermini with its combination of a zingy 1.25-litre engine, nimble handling and strong grip. On top of that, it's so refined it could easily get into a royal garden party. It doesn't matter whether you're a press-on type of driver, you're someone who takes just a gentle trip to the shops, or you're the sort of person who does the school run then commutes halfway up the country; whatever you need the Fiesta to do, it delivers and it'll make you smile doing it. It won't cost you a fortune to run, either, no matter what you ask it to do. Carbon dioxide emissions of 133g/km put the Fiesta 1.25i in one of the lowest company car tax bands, and average economy of nigh-on 50mpg means fuel costs won't put your monthly budget under too much strain. If ultimate economy is your absolute motoring ideal, then Ford will do you an Econetic version of the car, which does a fairly epic 76.3mpg and belches out just 99g/km of CO2 but it's expensive, and so the sums don't quite add up. Equally, there's a sporty 1.6-litre Zetec S model for those who place fun at the top of the list, but again it doesn't quite have the same delicate balance of abilities of our favourite model. So there you go, the Ford Fiesta's a brilliant winner buy one, it has all your needs covered.